When remodeling the bathroom, many people are unsure what they should do with their bathtub. 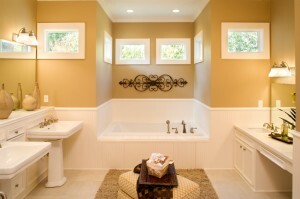 Most agree that something should be done, since an old, discolored tub won’t match nice new surroundings. The issue here is whether you should reglaze your old tub, or get an entirely new tub. There are advantages and disadvantages to both, though in the end, reglazing comes out slightly ahead in several categories. Replacing a tub is a labor intensive process, and can take the entire bathroom out of commission during the project. While you can do it yourself, it’s probably best to go with a contractor. Though there are plenty of cheap tubs, their quality is significantly poorer than more expensive tubs. In addition, many modern tubs aren’t built with the same craftsmanship with which older tubs were built. Add up the cost of a new tub and labor, and you’ll probably end up paying more for a new tub than you would to reglaze. Reglazing a tub is a less intensive process than replacing a tub, and you’ll still be able to use the other parts of the bathroom while the project is going on. It can take several days between the various phases of reglazing to complete the project, and it’s also more advisable to go with a professional here. Do-it-yourself reglazing kits are available, but their quality often doesn’t compare to professional grade reglazing. Reglazing a tub is generally cheaper than replacing a tub, and you’ll get to keep your old tub, which may be of a higher quality than a new tub anyway. In either case, Your Project Loan can help you get a loan for the bathroom remodel you’ve been wanting to do, so you can reglaze or replace your tub. This entry was posted on Tuesday, December 3rd, 2013	at 10:01 pm	. You can follow any responses to this entry through the RSS 2.0	feed. Both comments and pings are currently closed.